It’s taken a while, but I got around to upgrading my main hackintosh to 10.6.2 this week. As many hackintosh users have previously commented, upgrading to 10.6.2 results in a kernel panic early in the boot sequence. The cause of the crash appears to be an incompatibility with the kernel extentions I had in the Extra folder on my EFI partition. From Netkas.org I downloaded new versions of sleepenabler.kext and FakeSMC.kext which got everything working again. So far there are no new issues, just a few minor problems that I’ve had with Snow Leopard since 10.6.0 (which I hope to cover soon). The first system I tried Snow Leopard on was my 1st generation Macbook. I expected some problems installing onto a hackintosh but all the reports I have read so far say the Leopard to Snow Leopard upgrade works just fine. Unfortunately this hasn’t been the case with my Macbook. My hackintosh is now upgraded to 10.5.5 and all seems to be working well. 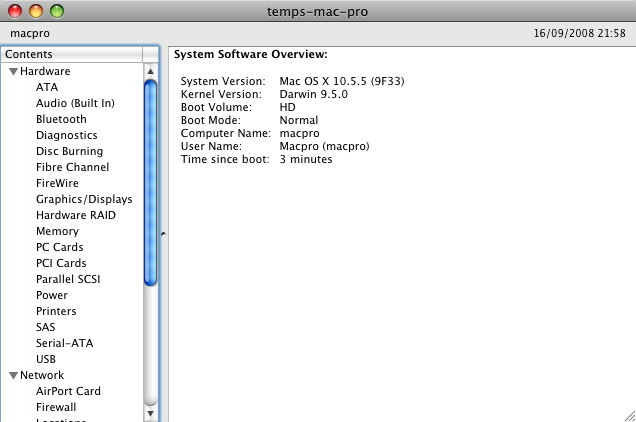 As shown in the image above, 10.5.5 comes with a new kernel 9.5.0. Video appears to be working fine as well, with Core Image and Quartz Extreme shown as Hardware accelerated and Supported. As before I tested the 10.5.5 update on my usb test drive before installing on my main partition. The Software Update method fails just as it always has before on my system, so the 10.5.5 package has to be downloaded from Apple.com. Using that will also cause a crash during installation unless I follow netkas’ guide to installing 10.5.2/10.5.3. It works just as well on 10.5.5 and requires a short command in a terminal window to remove a kernel extention as it is installed. Sleep seems to be working correctly as it has in the past couple of updates, though my SMB shares have still not appeared in the Finder sidebar. 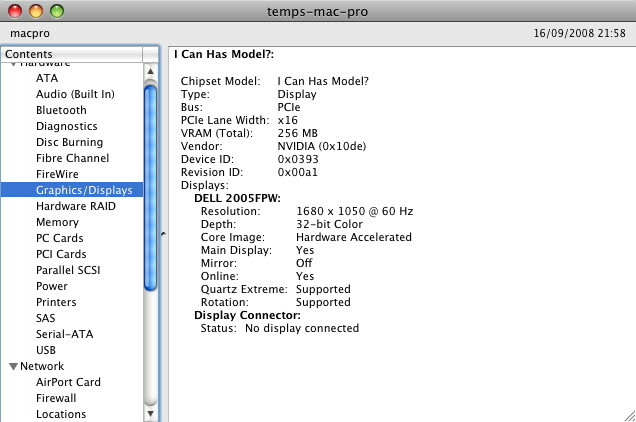 Maybe Snow Leopard will fix that one. UPDATE I hadn’t noticed that my sound output and input were not working after the update, but dropping ALCinject.kext and AppleHDA.kext from my backup drive into kext helper fixed that in 30 seconds and a reboot. I tried updating my iPod Touch to the latest 2.1 firmware this morning, downloaded through iTunes 8. The install process completed without a hitch, but my problems started when iTunes offered to restore the backup it made before upgrading. Once the restore was complete the iPod would restart and hang at the apple logo showing a frozen progress indicator. After 10 minutes I tried again, but the result was the same. The iPod locks up when restoring the backup, so there must be something in the backup that conflicts with the latest firmware.The upshot of this is that the only way I have found to get the 2.1 firmware working is to setup the iPod as a new device without restoring a backup, and let iTunes sync everything. That’s running at the moment so I will post some screenshots of the new genius feature when it’s done, then decide to stick with 2.1 and wait for a jailbreak, or drop back to a jailbroken 2.0.2.